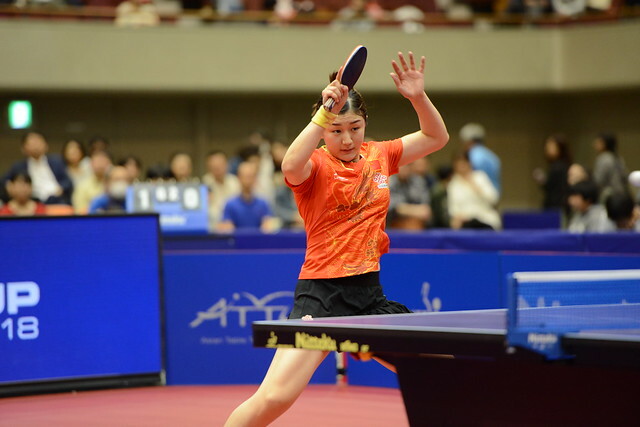 Imposing performances, players who so far this year have shared the top spot on the World Rankings, duly progressed to the final of the Women’s Singles event at the Lion 31st ITTF-ATTU Asian Cup Yokohama 2018 following success on Saturday 7th April. Furthermore, China’s Chen Meng and Zhu Yuling, the current order in which they stand and thus the respective top two seeds, showed only minimal charity as the semi-final stage as they continued their displays of sheer excellence. One wondered if Japan’s Kasumi Ishikawa, the no.3 seed, could dent the armour of the Japanese duo, having started the tournament in a rich vein of form; the recent Seamaster 2018 ITTF World Tour Platinum Open Women’s Singles title under her belt, she had never been troubled en route to the penultimate round in Yokohama. Chen Meng supplied the answer; very much the complete player, responding at the crucial moments, a five games win was recorded (11-7, 11-9, 10-12, 11-5, 11-9). Equally, in the opposite half of the draw, Zhu Yuling underlined her quality, the model of consistency, keeping one more ball on the table than your adversary the policy, she overcame Chinese Taipei’s Cheng I-Ching, the no.5 seed, in an equally impressive manner (11-8, 11-6, 11-7, 5-11, 11-6). Kasumi Ishikawa and Cheng I-Ching now meet the decide third place, for fifth and sixth positions Hong Kong’s Doo Hoi Kem plays Japan’s Miu Hirano; for seventh and eighth places Chinese Taipei’s Chen Szu-Yu and Korea’s Suh Hyowon face each other. In the play-off round Doo Hoi Kem, the no.9 seed, beat Chen Szu-Yu, the no.7 seed (6-11, 11-8, 11-4, 11-6, 11-5), Miu Hirano, the no.4 seed, accounted for Suh Hyowon, the no.6 seed (12-10, 11-6, 15-13, 3-11, 10-12, 11-3). Although it is only the top three names who gain invitations to the Women’s World Cup to be staged later in the year in Chengdu, realistically, those finishing in the top eight places in Yokohama will gain invitations. Play concludes on Sunday 8th April.